In the olden days, people... the well to do at least... used to go to a tailor for their clothes, a milliner for their head attire and when after a pair of shoes, the town bootmaker was the man (sorry, girls) for the job. Footwear was lovingly and painstakingly hand made, and repaired by the local cobbler season after season to gain the absolute maximum lifespan. These days, we have a boundless array of foot fashion to choose from... but we've not yet had the pleasure of specifying EXACTLY what material, colour, finish and heel height we're wanting, until now. Enter Shoes of Prey. Actually, it is a similar concept to what Converse and a couple of other sporting shoes companies have offered for a while. But the key difference is these are fancy, dressy shoes for us girls. Choose from soft leather, patent leather, glitter, snake skin, fish skin, cotton, silk or lace. 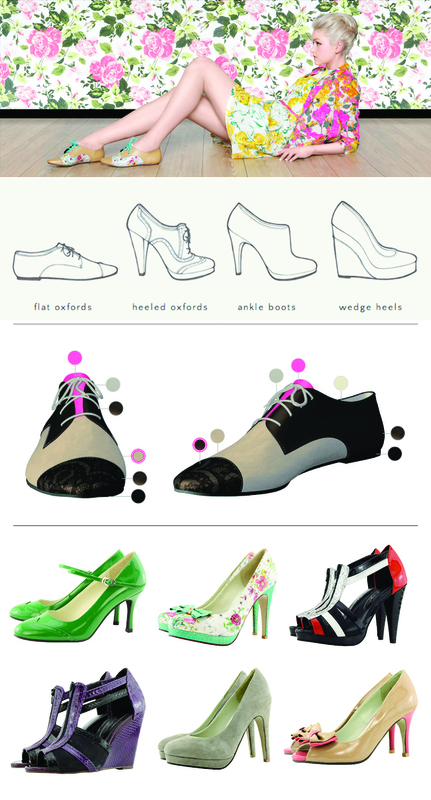 Choose the style, the fit, the laces, the heel height, go completely Priscilla-esque or Nanna-style... and create a pair of shoes which is uniquely you. Creating one of a kind, custom canvas shoes for yourself, the special person in your life, and family members.http://www.shoemycolor.com customer service team is committed to providing you the best service.